Tort reform is more than the change of one law or idea in our society. Tort reform is much greater. It is a combination of ideas and laws that will change the way our civil justice system works, which affects many things. Tort reforms will have a significant influence on all citizens, which makes it extremely important for everyone to understand. There are many associated goals with tort reforms, though they are all different. Goals include making it more difficult for people to file lawsuits; to place limits on the amount of money injured people can recover in a settlement; and to make it difficult for injured people to obtain a jury trial. However, this is a lot of backlash regarding tort reforms, giving them the nickname of tort ‘deform’. Many believe that the proposed laws will change the scales of justice for the worse, by changing the balance that exists. Tort reforms have been difficult for the general public to understand because of the amount of legal terminology and jargon that is used when describing the changes. This is unfortunate because it will have a great impact on the entire population. 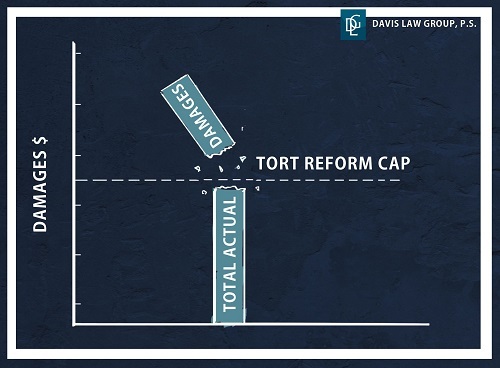 An example of a tort reform, is a cap on damages for medical malpractice. Meaning a person who was a victim of medical malpractice would have a limit on the amount of money they can receive in settlement; regardless of their medical bills. These regulations affect state laws. As you can see, a tort reform would have a significant influence on the general public – and not many people have any ideas what it is. As a law firm, we understand how significant these changes would be. We encourage everyone to do their research to better understand how these changes would affect your rights.